I started making the bows by die-cutting the foiled paper with the 3D Rolled Star die and used all three sizes. Then, I simply "rolled" each petal down using the end of a paintbrush! So instead of making the tight points like you would make for the rolled star ornaments, you more roll them straight down and then shape. I really love how they turned out! Here is just one way you can decorate - mini envelopes! I'm here today to share another cute card for Joy Clair Stamps!!! I am featuring the "Whale Hello There" stamp set today - isn't it adorable? I loved this sweet image! Once I stamped the scene, I used some watercolors to color the panel and then I added some ribbon and bling to decorate. The background paper has foil elements, so I felt that it didn't need much more than that! It's time for another Joy Clair creation! This month, we partnered with The Cutting Cafe to use their super cute cut files! Want to know something really cool about The Cutting Cafe's files? They come in PDF form along with the other cut file forms (SVG, etc) - SOOO if you don't have an e-cutter, you can still use them!! WAY cool!!! My Cricut is ancient so it doesn't sync online, but I was still able use the files!! LOVE IT! The card I created used the "Fun With Dress Forms" cutting file. I simply opened up the PDF file and printed it off! To decorate, I used the beautiful "Martha's Flowers" to stamp on the dress to create a floral print. Then, I watercolored the dress and added some "pearls" at the neckline! I hope you enjoyed this fun card! I have a new card to share with your for SparkleNSprinkle today! Since Easter is just around the corner, I thought it would be a great time to do some Easter inspiration. Do you send Easter cards? For this card, I used the Easter Parade stamp set! It's just too darn cute! For the eggs, I stamped the outlines in Versafine Clair Nocturne ink, then used a variety of embossing powders to decorate them! They were simply cut out and arranged on the card front. Tear-ific Tape was used to adhere the whole works together. I love adding faux stitches to things, so I used a journaling pen to add a frame around my scene. I cut a few hexagons using the tonic die for some background interest and added them behind my feature characters. Thanks for stopping by today! See you again really soon! How is it April already? Are you getting ready for Easter celebrations in your home? The Joy Clair Design team want to help you prepare by presenting some inspiring artwork featuring our Color By Faith stamp line! These beautiful stamps can be used for home decor, cardmaking, scrapbooking, bible journaling and more - whatever your imagination creates! 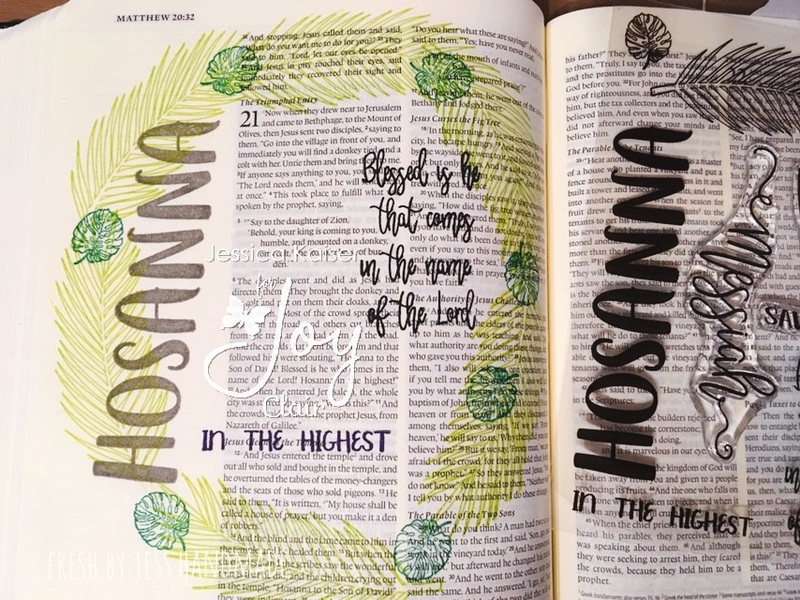 Today I am sharing with you a recent bible journal page I created using the Hosanna stamp set. I just loved how it turned out. It's a busy day on my blog today - this post is my first project of the month for Rinea! Aren't these flowers GORGEOUS? You will love making them too using the handy 3D Hyacinth Die Set. It is really easy to do - the instructions are right on the package! Simply cut, roll and glue!! As you can see, you can make different versions of the flowers - from tight blooms to more looser ones! I added a few handcut leaves to finish off my flowers, then tucked them into a terra cotta pot filled with river stones. So cute! They are perfect to tuck on a shelf or even on your kitchen table!